Every year, more and more scientific studies confirms the effectiveness of tapping techniques such as EFT Emotional Freedom Techniques for treating a number of issues. The GoE aims to catalogue these here. We understand this list is by no means comprehensive so please contact the GoE if there is an omission. Evidenced from the average score and time effect, emotional freedom technique resulted in higher decreases than systematic desensitization technique. Futher more, the more emotional freedom technique was given, the higher decrease of the public speaking anxiety of students would result. Blood cortisol results proved that Tapping contributed significantly (57%) to lowering anxiety levels and lowered (43%) blood cortisol level, indirectly affected the readiness to face childbirth process. The relationship between psychological and physiological conditions identified in this study is consistent with that found in other studies. Group treatment is cost-effective and efficient, and the efficacy of EFT in groups indicates the utility of the Borrowing Benefits technique. More than 60 research articles in peer-reviewed journals report a staggering 98% efficacy rate with the use of this procedure from psychological distress (posttraumatic stress disorder, phobias, anxiety, depression, etc.) to physical conditions (asthma, fibromyalgia, pain, seizure disorders, etc.) to performance issues (athletic, academic). Authors: Church Dawson and Feinstein David. Studies have indicated that the acupressure component of EFT is an active ingredient and not placebo. The current study supports the hypothesis that psychological intervention is beneficial for treating psychological comorbidities of obesity and points to the role mental health issues may play in this area. Quantitative findings indicated participants reported significantly less subjective distress and anxiety after using EFT. Qualitative findings indicated three themes whereby participants found EFT calming, relaxing and helpful; considered the transferability of EFT in other settings; and proposed some of the mechanisms of EFT's action. Results revealed a delayed effect for both groups at post-intervention, with improved eating habits, self-esteem, and compassion at follow-up. Findings provide preliminary support for EFT as an effective treatment strategy for increasing healthy eating behaviours and improving associated weight-related psychopathology. Mixed effect linear models indicated that EFT improved mental health and health-related quality of life, decreased somatic symptoms, anxiety/insomnia, social dysfunction, frequency and severity of respiratory symptoms, and increased lymphocyte proliferation with nonspecific mitogens Concanavalin A and Phytohemagglutinin (PHA), and peripheral blood IL-17. This study provides an initial indication that EFT may be a new therapeutic approach for improving psychological and immunological factors. Symptom improvements were similar to those assessed in studies of PTSD-positive veterans. EFT may thus be protective against an increase in symptoms and a later PTSD diagnosis. As a simple and quickly learned self-help method, EFT may be a clinically useful element of a resiliency program for veterans and active-duty warriors. Author Information - Gaesser AH1, Karan OC2. RESULTS: EFT participants showed significant reduction in anxiety levels compared with the waitlist control group with a moderate to large effect size. CBT participants (n = 21; M = 54.82, SD = 5.81) showed reduction in anxiety but did not differ significantly from the EFT or control. Don't stress: What do we really know about teaching gifted children to cope with stress and anxiety? The few interventions conducted, such as Gaesser's (2014) work using Cognitive Behavioral and Emotional Freedom techniques with gifted students, have demonstrated promising results. Recommendations include offering incentives in the form of grants and funding to researchers interested in investigating intervention outcomes and investigating stress-reducing methods and approaches, such as mindfulness, which have shown positive impact. Author Information - Hannah Chatwin Senior Research Assistanct at Bond University, Australia. Results: Findings revealed that both treatment approaches produced significant reductions in depressive symptoms, with the CBT group reporting a significant reduction postintervention, which was not maintained with time. The EFT group reported a delayed effect involving a significant reduction in symptoms at the 3- and 6-mo follow-ups only. Examination of the individual cases revealed clinically significant improvements in anxiety across both interventions. Author Information - Bond University, Australia and The Lakeside Rooms, Robina, Queensland, Australia. Address for correspondence: Peta Stapleton, School of Psychology, Bond University, Gold Coast, Queensland, 4229, Australia. Overall, EFT and CBT demonstrated comparable efficacy in reducing food cravings, one's responsiveness to food in the environment (power of food), and dietary restraint, with Cohen's effect size values suggesting moderate to high practical significance for both interventions. Results also revealed that both EFT and CBT are capable of producing treatment effects that are clinically meaningful, with reductions in food cravings, the power of food, and dietary restraint normalising to the scores of a non-clinical community sample. While reductions in BMI were not observed, the current study supports the suggestion that psychological interventions are beneficial for food cravings and both CBT and EFT could serve as vital adjunct tools in a multidisciplinary approach to managing obesity. 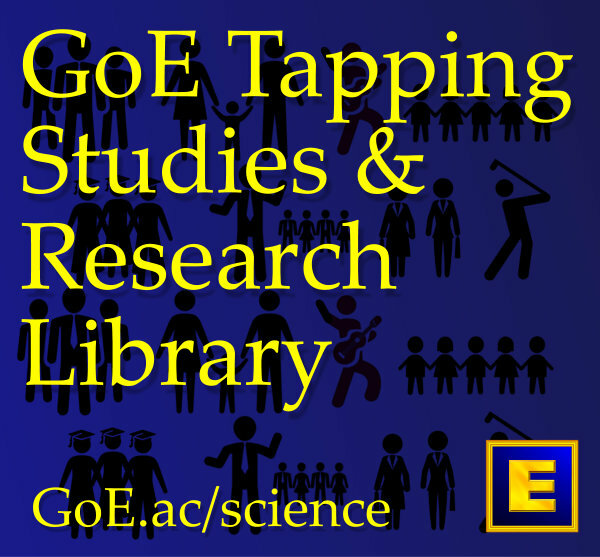 Effect of EFT Tapping on Stress and Anxiety in Nursing Students - A Pilot Study. Quote: "ANOVAS revealed that EFT produced significantly greater improvement than did diaphragmatic breathing behaviorally and on three self-report measures, but not on pulse rate. The greater improvement for EFT was maintained, and possibly enhanced, at six- to nine-months follow-up on the behavioral measure. These findings suggest that a single treatment session using EFT to reduce specific phobias can produce valid behavioral and subjective effects." Facts, paradigms, and anomalies in the acceptance of energy psychology: A rejoinder to McCaslin's (2009) and Pignotti and Thyer's (2009) comments on Feinstein (2008a). Is Emotional Freedom Technique (EFT) as effective with Complementary therapy students as Sport Science students? Can Matrix Reimprinting using EFT be effective in the treatment of emotional conditions? A service evaluation in Sandwell. Submitted to Energy Psychology. Can Emotional Freedom Techniques (EFT) be effective in the treatment of emotional conditions? In press. Results of a Service Evaluation in Sandwell. Psychological Therapies in Primary care.